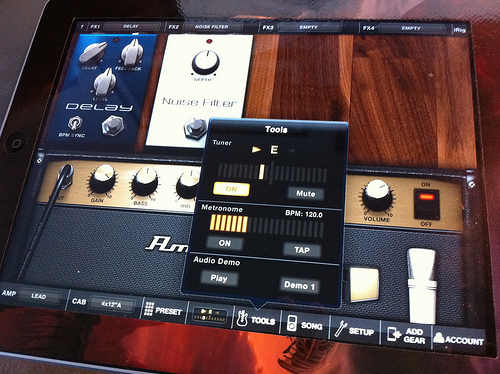 Want to know the best way to hook up your Les Paul or Strat to your iPad? Then read on. We all have our favourite online and offline stores for strings, straps, cases and other guitar accessories. You might even have found an eBay seller who stocks just the right weight of nylon Jim Dunlop pick and always has them in stock. And whether you favour Ernie Ball or Dean Markley, chances are you know exactly who to trust when it comes to buying new strings. Less easy, mainly because it’s such a new area, is figuring out the best way to connect your iPad or iPhone to your Flying V guitar. Headphone socket or Dock connector? What’s the difference? iRig or Apogee? If you’re going to invest in a piece of kit to take the place of your amp, at least for practicing, you want to make sure you choose the right guitar accessories. We love that we can hook up our Fender Telecaster to an iPad or laptop, plug in a decent set of headphones and re-create some of the tones from our favourite guitar players. The technology is improving all the time and some of the software – Guitar Rig, Amplitube, etc – is excellent. But we get that the idea of hooking up your guitar to a tablet rather than an amp on stage isn’t for everyone (though we’d be happy if we never had to haul another Marshall rig into the bag of a van again), so we won’t bang on about it too much. Ok, we will, but not to the detriment of covering ye olde fashioned amps, cabinets, and speakers. While we’re on the subject, you’ll find (eventually - hey, we’re just getting started :-)) lots of coverage of guitar apps for iOS and Android on the site. Why? Because we love ‘em and so do lots of you. Whether it’s an amp modelling app, a tuner, or a chord dictionary, there are some terrific apps around. The way we play guitar may not have changed much in over a century, but away from fingers on strings, the world and the way the guitar fits into it is unrecognisable from the way things were even a decade ago. Guitar Hive is all about reporting on the interface between guitar and new tech, but at the heart of it is the music, and most importantly of all, the way it makes us feel. Image by Joe Bustillos on Flickr.